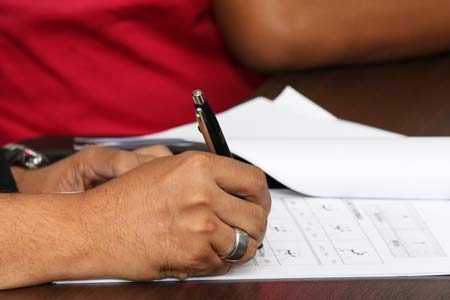 English exam courses are recommended if you need to prepare for an internationally-recognised examination to assess your English level of proficiency. The most well-known English examinations are IELTS, the Cambridge exams (PET, KET, FCE, CAE, CPE), TOEFL and TOEIC. ❶ Learn strategies and exam tips to be more successful on the day. ❷ Develop English fluency and pronunciation for speaking exams. ❸ Practise examination questions tasks for each part of the exam. ❹ Improve vocabulary for a variety of common English exam topics. ❺ Learn faster with personalised English exam courses and valuable feedback. What do English exam courses include? Our English exam course is designed to prepare you for an official English proficiency examination. You may need to take an internationally-recognised English exam to study abroad (e.g. at university), to apply for work visas or residence permits. Exam preparation courses include reading, listening, speaking and writing tasks that focus on commonly-used examination topics and develop academic English vocabulary. We cover all the question types that are important for the specific exam that you plan to take. We also provide practice exams with feedback and give study tips and exam strategies to help you on the day of the examination. We provide English trainers who have experience in preparing clients for official English proficiency exams. They are qualified teachers and able to provide professional training and feedback. Private English exam courses provide the best opportunity to prepare for an English proficiency examination. English trainers adapt courses to focus on specific examination areas for your needs with feedback and practice tasks. You can choose one-to-one sessions or schedule English exam training with a private group of friends or colleagues. We check your current English level for English exam courses, and recommend that you already have an English level of Intermediate (B1+) or higher to get the best outcome. You can even take our free online English test today! You can also choose to have a specific focus on Business English, or you can take English courses which develop your communication skills for all areas of General English.